Henry Glass Fabrics: Are you the next Desire to Inspire Challenger?? Looking for someone who loves Christmas! Are you the next Desire to Inspire Challenger?? Looking for someone who loves Christmas! It's time to get started on Christmas projects! Here is your jump start with this month's Desire to Inspire Challenge. We are looking for someone who LOVES Christmas, and Jolly Ole' St. Nick in particular. We want a challenger who will take these fabrics and make something great in a month! PLEASE REPLY AS SOON AS POSSIBLE! We will pick someone on Wednesday, May 3, 2017. 4. 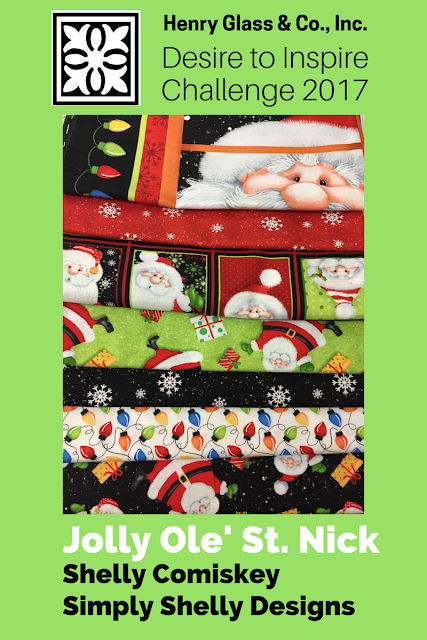 WE send you the "Jolly Ole' St. Nick" fabrics shown above. 5. YOU make something AWESOME during the month of May, with pictures and your story. Oh my gosh these are beautiful fabrics. And I absolutely love Chistmas. Unfortunately I'm traveling without a sewing machine and wouldn't be able to meet your deadline. Boo hoo. But I will happily share on Facebook & Twitter. I would love to be chosen...hopefully you like applique as that is my favorite technique....I believe it makes my items truly one of a kind! I love Christmas! I have a couple ideas forming with this line. Who could resist a Santa that cute? So adorable. I love this line!! What could be cuter for a Christmas project then jolly ole' st nick peeking in your window! I had a great time with my first challenge and I know this one will be just as much fun...if not more!! I am sure that the person you choose will have a great time working with this fabric. Great fabric collection--would love to make something with it. I'm sure I missed being able to enter, but I'd love love love to do this.